We prefer to receive your initial enquiry by e-mail as it then allows us to do some research regarding your request - however if you are averse to electronic mail then we can be contacted by telephone or Skype. Hurawalhi is an enchanting private island surrounded by a beautiful lagoon, excellent house reef and long stretches of white sandy beach. The only Resort on the island, Hurawalhi is about 400 meters long by 165 meters wide, about 6.5 hectares (16 acres). Your direct seaplane transfer from Velana International Airport is a scenic, 40 minute flight. 90 Villas, including 60 over-the-water Ocean Villas and 30 Beach Villas, some with an infinity pool and/or a sunset view. The Villas offer privacy, spaciousness and comfort. All feature the same contemporary design, the epitome of tropical chic with clean lines, earth tone colors and natural building materials which harmonize perfectly with the surrounding lush, landscaped vegetation on this unspoiled island. Villa furnishings include a king size bed, air conditioning, overhead ceiling fan, personal safe, sitting area, wooden floor, wardrobes, vanity, workspace with charging stations, and private sundeck with chaise lounges, table and chairs. 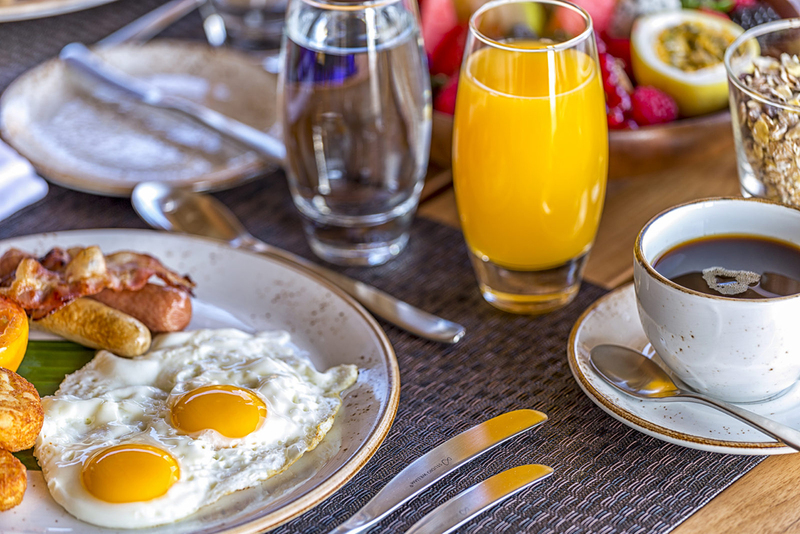 Villa amenities include a wine fridge, mini bar, espresso machine, complimentary tea and coffee, IDD telephone, Free WiFi, Bluetooth sound bar, and a 48-inch flat screen IPTV featuring the latest movies. The indoor bathroom features a luxurious rain shower, double sinks, hairdryer, bathrobes, slippers and nightly turndown service. Guests enjoy complimentary use of chaise lounges at the beach and pool, and beach towels Electricity is 220VAC, 50HZ. UPON ARRIVAL After clearing Immigration and Customs, you are greeted by our Airport staff and escorted to check-in at the TMA seaplane ticket counter, after which you are transported to the TMA Terminal in our private vehicle. Our staff welcome you with a refreshing, cold face towel, warm hospitality, complimentary beverage, snacks and Free WiFi, while you relax until your seaplane departs. UPON DEPARTURE The Lounge at the TMA seaplane terminal remains open in the late afternoon and evening so you can relax in comfort until the time you must check-in for your flight home at the International Departure Terminal. Our staff welcome you with a refreshing cold face towel, complimentary beverage and Free WiFi Private transfer is also provided to the International Departure Terminal. There is a fee of US$25 per person for the above services. Guests may book before they arrive or while at Hurawalhi Guests may order snacks or dinner from an a la carte menu and pay directly at the Hurawalhi Lounge. • 15 OCEAN VILLAS (105 SQM) over-the-water without infinity pool. 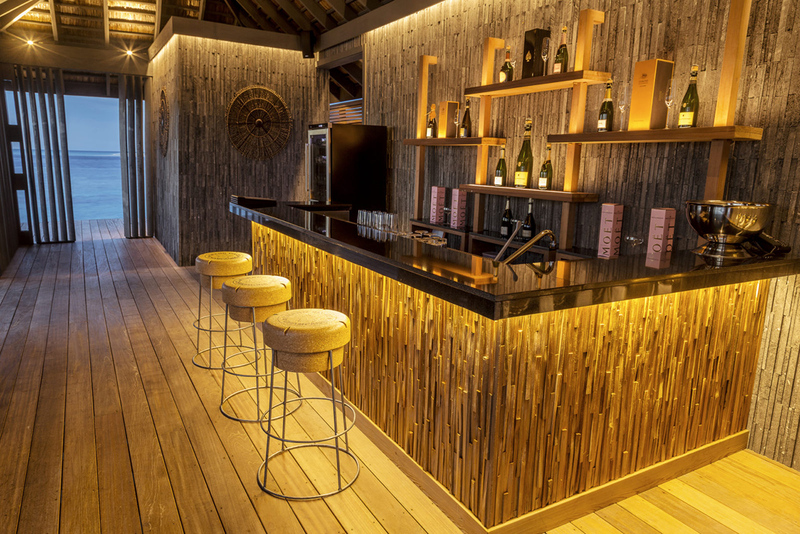 Get a glimpse of living the high life by indulging and unwinding in an Ocean Villa. This over-water accommodation is bringing opulent design to the striking natural beauty that Hurawalhi is known for. Celebrate luxury and embrace nature on your doorstep: take a dip in the ocean straight from your sundeck, and let the gentle lapping of the waves beneath your villa create a sense of serenity and tranquility in what is to be wrapped up as your most exquisite holiday. • 15 BEACH SUNSET POOL VILLAS (132 SQM) on the beach with sunset view with infinity pool. Find beachside bliss in Hurawalhi’s Beach Sunset Pool Villa, which draws together all marvels of the Maldives that you desire: captivating views of the sunset, pure pleasures of having your private, ocean-facing infinity pool, and a beach leading to a translucent lagoon just steps away to round the perfection off. Your Beach Sunset Pool Villa will impress with its charm and the surreal setting; the joys of island life, which makes time seem to pass by more slowly, are yours to embrace – the sand, the sea and the sun come with compliments of Hurawalhi. • 15 OCEAN POOL VILLAS (132 SQM) over-the-water with infinity pool. An awe-inspiring backdrop and contemporary design unite in the Ocean Pool Villa to make your long-lived fascination with over-water luxury a reality. 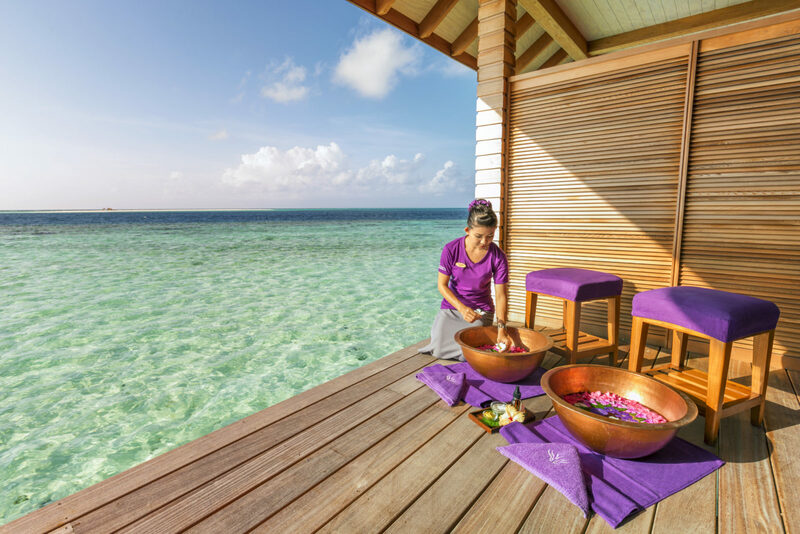 Be swept away by your private retreat perched graciously above the shimmering Indian Ocean and feel the magic of the Maldives. This emblematic villa conveys a picture-perfect scene: the spacious and sleek interior leads to a refined sundeck from which you can slip into the emerald lagoon, and let your mind wander during cherished moments spent in your very own infinity pool. Canneli Restaurant, on the beach, serves “all you can eat” delicious buffet style meals for breakfast, lunch and dinner, featuring a variety of international and Asian selections in a traditional open-air dining room with live action cooking stations. Indoor and outdoor seating “al fresco”. 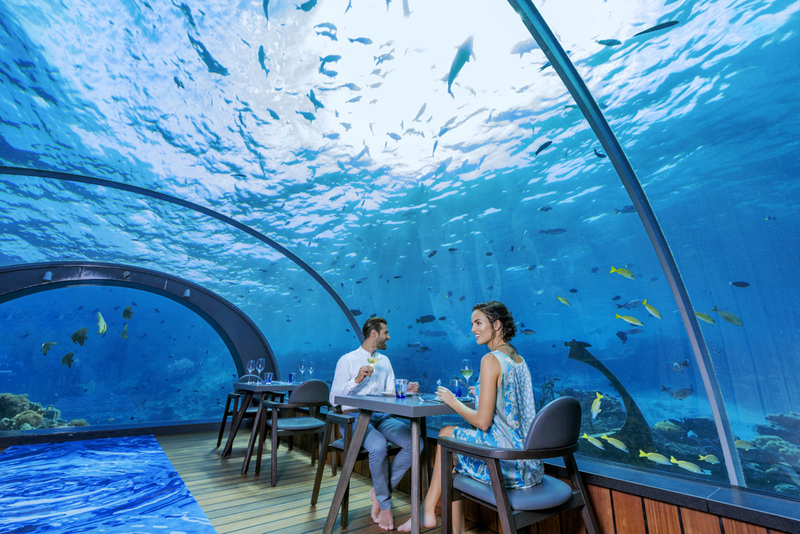 5.8 Undersea Restaurant - the world’s largest, all-glass undersea restaurant for lunch and dinner. Walk down a spiral staircase and be seated at 1 of the 8 tables located 5.8 meters (18 feet) beneath the lagoon where you enjoy a world-class tasting menu and a selection of fine wines from our cellar while being entertained by an exciting natural show of fish swimming around the magnificent surrounding coral reef. Kashibo Restaurant features Asian street food for your indulgence. you can enjoy a range of seafood staples, vegetarian dishes as well as teppanyaki at this lively over-water restaurant. including shochu cocktails, while enjoying the tropical breeze as you gaze out onto to ocean. 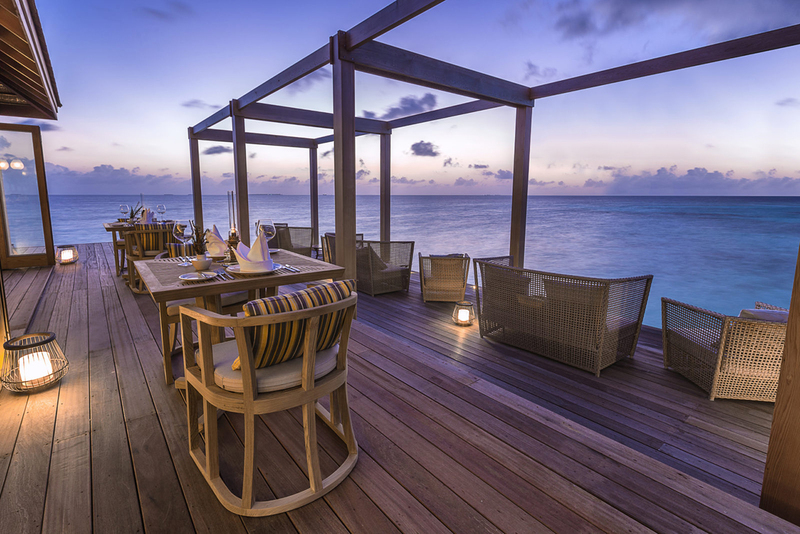 Evenings at Kashibo are just as beautiful as the day, with a drink in hand, enjoy illuminated ocean waters and glimpse the sharks and rays as they swim past. Other dining options include a Snack Menu at the Coco Bar and Pool, In-Villa Dining (24 hour service) and Candlelight Beach Dinners. The Resort Sommelier will help you choose from the worldwide selection of more than 355 international wines displayed in this windowed showcase in the Aquarium Restaurant. Coco Bar, located on the beach with al fresco deck overlooking the lagoon, the place to enjoy your favorite drinks, watch the beautiful sunset or after dinner, enjoy the evening entertainment, watch your sports events on the big screen or play board games. Open 24 hours. Indoor and outdoor seating “al fresco”. 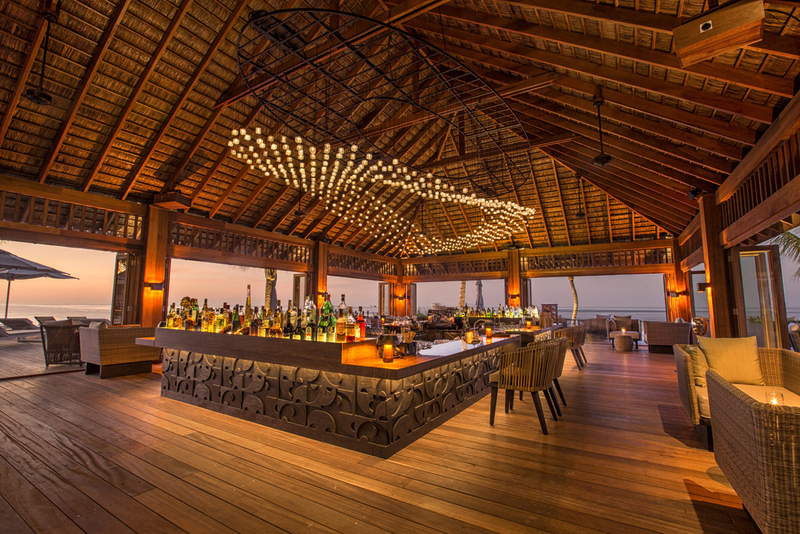 Aquarium Bar, over-the-water, a chic getaway for an after-dinner drink away from the crowd while enjoying the peace and quiet of the surrounding lagoon and the tropical sea breeze. Indoor and outdoor seating “al fresco”. Champagne Pavilion, over-the-water, at the end of the Ocean Villa jetty, is the perfect intimate rendezvous at sunset for a romantic Champagne toast and canapés. Seating “al fresco”. Over-the-water provides a truly tropical spa experience focused on wholeness, simplicity, purity and quality. The Therapist’s healing energy combined with Asian massage techniques and using only chemical free, pure organic compounds, follows a natural, holistic, personalized approach to caring for each guest’s health, beauty and wellbeing. There is plenty to do at Hurawalhi: sunset cruises, island hopping, sightseeing at local islands and more. Beautiful white sand beach, a magnificent lagoon and an excellent house reef for snorkeling. A sparkling clear, freshwater infinity swimming pool overlooking the beach, artificial turf courts for football (futsal), tennis, and badminton; a beach volleyball court, a Fitness Center with Personal Trainer, and a deep sea sports fishing boat. Provides regularly scheduled guided diving and snorkeling trips, equipment and accessory sales, rental and repair, and a complete PADI 5 Star training center. A hyperbaric chamber is located nearby at Kuredu Island Resort. The Maldives has the world’s largest known population of reef manta rays. The Manta Trust is a well-known, UK based, independent non-profit organization, whose mission is to advance conservation of manta rays and their habitat through science, research, raising awareness, and creating influence by providing education. Guests can take part in workshops and trips run by Hurawalhi’s resident Marine Biologist. Our Team is here to share our passion for and knowledge of the marine environment with you and hope that your understanding will help conserve the natural beauty of the coral reefs. 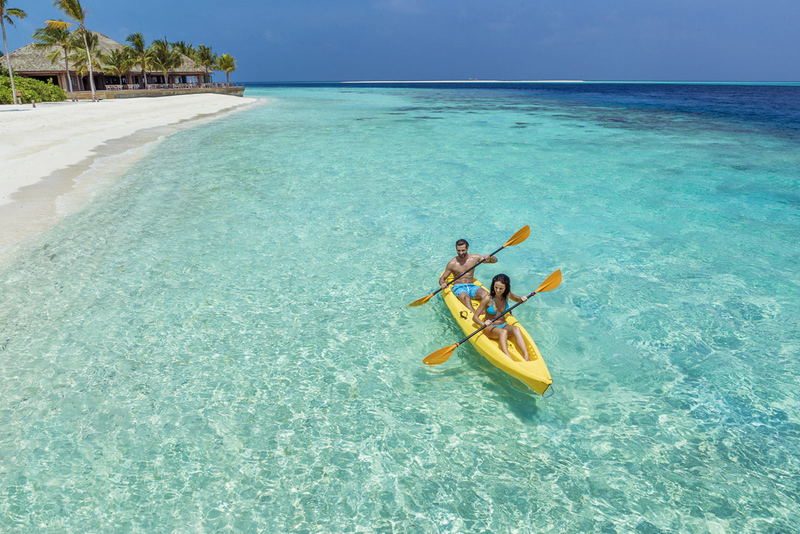 Offers jet skis, parasailing, water skiing, wakeboarding, fun-tubes, sofa rides, windsurfing, kayaks and catamaran sailing for rental and instruction, as well as private guided snorkeling speedboat excursions. Located in Coco Bar, air-conditioned, with table tennis, billiards, darts, foosball, pinball machines, board games, mahjong and chess. Includes Bodu Beru cultural dance show, live music, DJ disco, diver’s video night, Maldives cultural & history presentation and other themed events. Temperatures are consistently between 26 - 32 Centigrade - and the tourist seasons are dictated by the change in the monsoons. We are able to offer flight inclusive holidays from the UK. The major hub is London Heathrow with a very wide selection of airlines and timings - however flights can also be arranged from London Gatwick, Birmingham, Manchester, Newcastle and Glasgow. A Retail Agent for Hummingbird Travel Ltd.